To attend CUWiP, students must fill out this application at the American Physical Society website. Applications close on 16 October 2015. 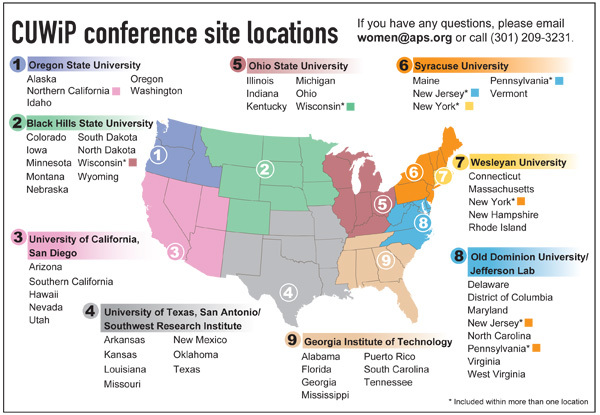 Students should apply through the link above, and select Syracuse University if they are in the orange region on the map below (Maine, Pennsylvania, New Jersey, Vermont, New York) OR they have a specific reason for wanting to attend the Syracuse conference (such as its focus on intersectionality). See the Program page for specific details on the schedule and workshops. Applicants who are accepted to attend one of the conferences will be notified by the end of November, and will be given instructions on how to register and pay the $25 registration fee.